Two-way Instapaper.com sync for your ebook reader. Is there a better alternative to Ephemera? Is Ephemera really the best app in Miscellaneous category? Will Ephemera work good on macOS 10.13.4? Ephemera allows you to read your news on your ebook reader. Ephemera will comfortably synchronize your ebook reader with Instapaper.com via USB. It works with the Amazon Kindle, Sony readers and pretty much any device capable of reading HTML, Mobipocket or EPUB files. Two-way Instapaper sync. By default, Ephemera gets your unread Instapaper news as single articles. Read one, delete it on your reader, and during the next sync it'll be archived on Instapaper.com. FIX: Sometimes, articles come back empty; added handling of those cases. FIX: Fixed stalled loading when there are no unread articles. Your Instapaper account\'s \"automatic archiving\" setting must be disabled. See this support thread for more info. Ephemera needs a review. Be the first to review this app and get the discussion started! Ephemera needs a rating. Be the first to rate this app and get the discussion started! Plug, Sync & Go. 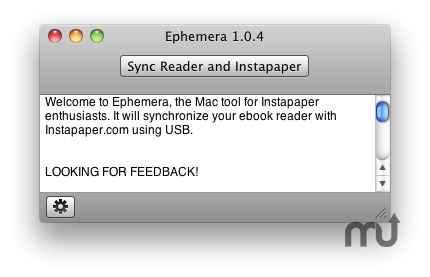 If you want it to, Ephemera will automatically start up, sync, and then unmount your reader when it detects the USB connection. Configure the app once, and then just have it work for you - by simply connecting your reader! Getting your news in the shortest possible time onto your reader: a great feature when you're in a hurry - as most of us are in the morning. A more affordable Kindle experience. No Whispernet traffic fees! Especially non-US Kindle users might enjoy that.